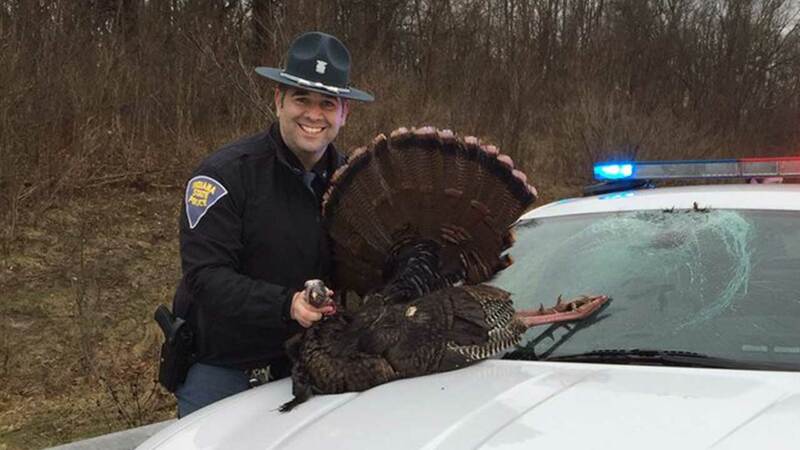 INDIANAPOLIS (WLS) -- A wild turkey crashed into the windshield of an Indiana State Police cruiser -- the third incident this week on Indiana roads. The latest incident occurred Friday along the Indiana Toll Road in LaPorte County in northwest Indiana, according to state police. Trooper Aron Weller, who was driving the vehicle, was not injured. On Wednesday, Trooper Tia Deaton was driving along State Route 56 near Scottsburg, just north of Louisville, when one of the birds smashed into her windshield. Deaton also was not injured. On Tuesday, the Tarabocchias, of N.J., was leaving Notre Dame University, where the daughter was recently accepted, en route to O'Hare International Airport when a 30-pound male wild turkey was impaled in their rental vehicle. They were traveling west on U.S. 20 near Wilhelm Road, close to Rolling Prairie. The family -- father, mother, teenage son and 78-year-old grandmother -- sustained minor cuts from broken glass. The La Porte County Sheriff's Office said incidents like this are rare, but wild turkeys are mating right now and the birds are in abundance less than a month before hunting season starts again.